November 13, 2018. 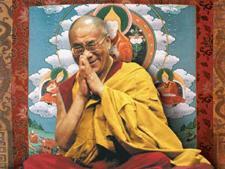 Yokohama, Japan – His Holiness the Dalai Lama arrived in Yokohama from India yesterday on his 25th visit to Japan. Although the views over the bay from his hotel window were grey, His Holiness was bright and refreshed by a good night’s sleep after his journey. He opened his conversation with Rina Yamasawa of NHK with a recollection of his first visit in 1967. His elder brother, Taktser Rinpoche, was here and over lunch teased His Holiness, who had become a vegetarian, that he had the tastier bowl of udon noodles. His Holiness answered a first question about how he sees the situation in Tibet today by reviewing his three commitments. He noted that at the end of this month a convening of leaders of Tibet’s spiritual leaders will take place, primarily focussed on raising the quality of Buddhist knowledge and practice. The question of a future Dalai Lama may also be on the agenda. When Ms Sakurai lamented that the Chinese authorities seem to be doing little for Tibetans and Uighurs, His Holiness replied that he saw the past 70 years in terms of four eras affected by Mao Zedong, Deng Xiaoping, Jiang Zemin and Xi Jinping. Although the same party remained in power, guided by the same constitution, nevertheless great changes had taken place. He noted that there still remained room for further change. He also remarked that 1.2 million Chinese have a right to know what is really going on and when they know that, he expressed confidence in their ability to judge what’s right from what’s wrong.